I admit it, I’m not big on following the “rules” in photography. 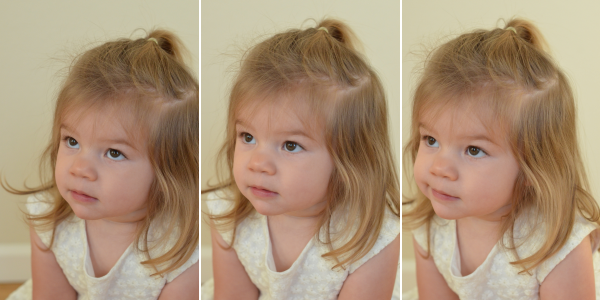 I shoot in continuous mode, and I ignore most framing rules like the rule of thirds. 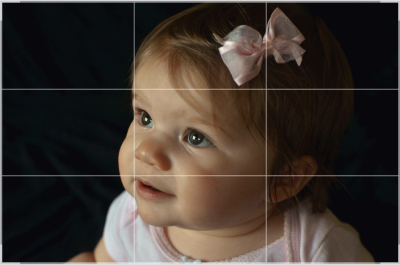 The rule of thirds is a practice designed to help break the center-centric habit most beginner photographers have. 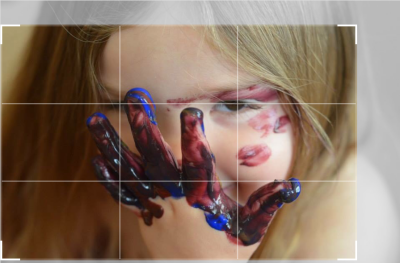 Rather than place the subject in the dead center of the image, placing them off center (along the thirds grid line) usually creates a more dynamic image. 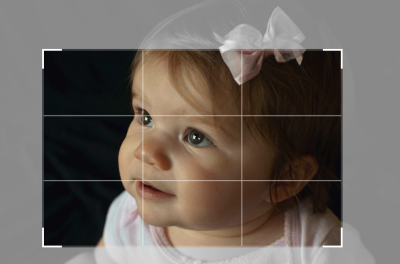 Most rule of thirds advocates suggest having at least two focal points in the four grid line cross sections. I support the principle, but like any rule it can be over done. Equally important to the placement of the subject is the overall background, and the overall look and feel of the image. In my opinion, it’s not worth adhering to any placement rule if it leaves a distracting background element, or forces you to crop out part of the scene that makes the image compelling. Here’s an example from one of my favorite photos of Alexis. Original on top, with grid lines below. The corner of her mouth touches a grid lines, but the focal points (the eyes) do not. In fact, the close eye is dead center in the image. Now watch what happens when I recrop so the back eye and lips touch the grid line cross section. The framing of the face isn’t bad. Truth be told I probably should have gotten closer, and a tighter crop achieves the same effect. The problem is that darn bow. It’s cut off. It’s both distracting and detracting from the original image. The cropping gets substantially worse if I try and force the close, dominant eye to a cross section. Here’s another example using one of my favorite photos of Nicole. This one happens to correspond with the rule of thirds in that the tip of her middle finger touches the cross section of the grid lines. The other focal points, do not. The best recropping I was able to do puts both eyes in opposite cross sections and yields the following. You lose the hunched over shoulder. Recropping to other focal points losses part of the hand. Both lessen the impact of the photo. 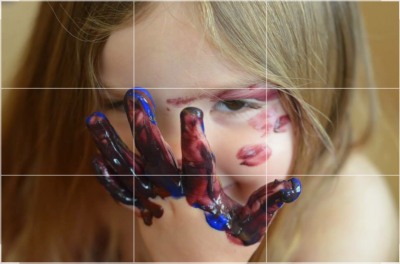 All this is to say while the rule itself isn’t inherently bad, not all photos work with the rule of thirds. Rules in photography, like rules in any art form, should be used as training tools. It’s useful to experiment with them, but strict adherence to the rule will be limiting and could cause you to miss the ideal shot. At least that’s this photographer’s opinion. After my last post on using a spot light to create high contrast, I kept thinking back to my accomplishing the same shot. Specifically, could I use a natural light source? How much of a difference does the F-Stop make? Effectively the same setup as before, but using the sun coming in throw a window as a spotlight. Trying to do this with natural light increased the difficulty factor dramatically. With the desk lamp I had totally flexibility with the position of the light source and the camera. I could move it further back and have a wider beam, or closer for a more intense narrow beam. While I could in theory pose the cat, she tends to have a mind of her own. With the natural light source, I effectively had two fixed objects. I couldn’t position my camera well. End result, is a poorly lit eye. Maybe I can say I was going for moody feel? But it works. I can call this experiment a success. The window helped focus the light into a narrower enough beam that the forground was lit and the background was not. The white walls behind the cat are nearly black in the picture. I definitely prefer my previous photo. With more practice I may be able to better utilize the window light, and come up with a better photo. Truth be told, I’m not sure the additional practice would be worth it. This is one example where natural light isn’t always preferential to artificial light. If you want to try this type of photo, and you don’t want to purchase a softbox, I recommend a directional lamp with a really bright, natural light bulb. This is the one I used. Don’t let the sales price fool you, I’m pretty sure it’s always $20. If you’re shooting anything larger than a cat, you probably need something more substantiation. Today there was a discussion on dramatic lighting in one of the photography forums I lurk, specifically having your subject fully or patially illuminated and the background dark. At first I was all easy peasy, been there, done that. Dark background, large aperture, single light source, right? Nope. Turns out there’s a completely different way to get the same effect! Of course, I simply had to give it a try. As soon as Nicki was in bed I grabbed my camera. The goal is to create a large differential of light on the subject vs the background. This doesn’t mean it needs to be dark out. In fact, it’s easier to focus on the subject if there’s ambient light. (I have a faulty lens that has difficulty focusing, so this is an important discovery for me.) Usually one uses softlight boxes to illuminate the subject and create that differential between subject and background. Light boxes are more focused light than what I used – sun streaming in from a window. I don’t have soft lights, but I do have a good craft light with a very bright, natural color light bulb. Spotlight diagram. No need to worry what’s in the background, as long as your light source is focused away from the background. The above photo? Nicki’s red train is in the background. The first thing I noticed was the metering light could not be trusted. This is not one type of photo were auto is your friend! I had to change the settings to shoot much darker than the camera wanted. You also want to set your F-stop fairly high, for nice crisp edges. Lily was fascinated by what I was doing. She kept rubbing up against the lamp, and sniffing at the bulb, so I decided to try and photograph her next. Alas, that’s where I started to struggle. The craft light is meant to be a desk light. It generates a narrow beam of light than a softlight box would, which means I had a small area to work with. Little movements from Lily generally meant most of the light wouldn’t fall on her. Inanimate objects are usually much more cooperative. I think I prefer this technique to the one I used in the past. I’d like to try it on Nicki one day, but I will need to figure out a better lighting situation first. It has been two weeks since I last picked up my camera to take a photo of Nicki. Two weeks! Before the move I was managing to take photos at least four or five days a week. They were usually nothing special (bath time, playing with toys) but at least I was taking them. I don’t even know where the good light is in our apartment. I decided to rectify that this weekend and have another go at the pearl photos. Back at our old place the window was at the foot of the crib. Her room faced West, so by about four o’clock or so (depending on the season) the light would just stream into the nursery. I’d use the blinds as a poor man’s defuser, and got the kind of photos you saw previously. If I stood by the window there was very little shadow, standing by the side of the crib and I would get the really nice profiles. It was usually one of my go to spots for Nicki photos. Since her new room faces west-ish, it was the first place I thought of. I figured the afternoon would be the best time to shoot in our new place as well. Her room gets hot in the afternoon, hot from heat generated by the sunlight. Alas the sun, window, and crib don’t line up as nicely here. The blinds here don’t work as well as a defuser. They are the vertical kind where you have much less control over how much light is coming in between each blind. Strips of light are always peeping through at least one slat, which don’t look very nice in photos. I had to wait until the light was no longer directly on the crib which only gave me a twenty minute window before the sun slipped behind the edge of the building and the room was too dark. Another (minor) issue was the position of the crib. It was against the back wall rather than right up against the window. In that position the railing blocks the light, especially when using a backdrop. In the above photo the light source is actually to her left. Most of the light blocked by the crib, and her face is illuminated from the right by the light bouncing off the wall. It’s really pretty, but I had to shoot at a higher ISO and a wider aperture that I was hopping for. This morning I was in Nicki’s room fixing the blinds and noticed that her room was actually very bright in the early morning hours. That’s when it dawned on me that her room was actually hot during her nap time (1 pm) not late afternoon. It takes time for the room to warm up, which means the room has been bright for a while. At our old place her room didn’t start warming up until 2 or 3 in the afternoon. Morning is the way to go! Low ISO, tight aperture and I can still avoid motion blur. Next time I’ll know better! After being over zealous with the saturation, brightness and contrast. The one area where we’re really lacking is the uncluttered wall by a mirror and light source like I used for my bump shot maternity photos. That was also the same place I took the avatar photo of myself with my camera. I will miss that spot. Last week I posted some things I learned going off auto mode on my camera. But what if you’re not neck deep in the camera-setting-obsessed build-a-set-at-home momtographer-crazy-pool like me? Here’s my number one go to trick for taking photos of Nicki that dosen’t involve any camera knowledge. In fact, to emphasize that you don’t need expensive camera equipment or software, all photos in this post were taken with my cell phone and completely unedited. Not even to adjust the brightness. Cute, right? 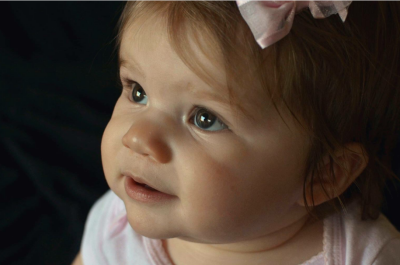 She’s looking out the airplane window and smiling. It’s safe to assume I’m not climbing over another passenger to take this photo. 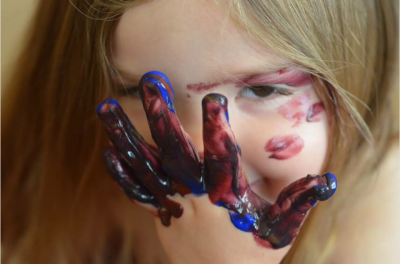 (I’m a crazy mom-tographer, not an obnoxious one.) I’m sitting in the same row as Nicki who is safely strapped into the window seat. That means Nicki is in-between the window and myself. If she were truly looking out the window, we’d be seeing more of the side/back of her head. In order to capture this photo I’m using the same simple trick behind the holding the pyramids illusion. The human eye is really good at judging relative distances in 3-d. That’s why someone far away looks far away, and not just small. A 2-d projection of a 3-d object (e.g. a photograph) can trick our minds’ eye into interpreting the image differently. In this pyramid photo it looks like the man is looking at the pyramid in his hand. Of course, the pyramid is just far back, and the man in the photo is looking off camera at nothing at all. Since Nicki is a baby I can’t just tell her where to look. That’s where Domingo comes in. In my airplane photo I’m actually in the aisle seat. Domingo is in the middle seat, leaning in front of Nicki to entice a smile. She is looking at Domingo and smiling. A pullback. Ignore the quality of this photo. I wouldn’t share it, except that it shows how we made the top one work. The window is about four inches above her head. I’ve rotated the camera about 30 degrees to the left so the window appears level with Nicki’s face and positioned it so Domingo is off frame. Voila, the illusion of looking out the window. There are five possible axis to move your camera: up/down, left/right, toward-subject/away-from-subject, rotate and tilt. Here she is with great grandma. If Nicki were truly looking at Grandma, we’d just be seeing much more of the underside of her chin. She’s looking at Domingo, standing off frame and making faces at her. In this one she looks like she’s in the Christmas spirit, even though she’s clearly not looking at anything in particular. I posted an edited version of this one a few ago. For this photo I’m lying on my stomach, holding the camera about eye level (maybe Nicki’s shoulder) and have tilted the top of the camera ever so slightly toward Nicki so that the tree and presents are in a better position relative to her in the photo. This trick doesn’t just work for babies! Back in my maternity photography days, I recommended looking six inches in front of the bump for a more flattering angle.